This may seem as a fairytale - but read it all, and you will recognize a lot of wisdom. If this is all a fabricated story - it is though filled with ancient and spiritual knowledge and wisdom of a remarkable kind. And their claim to be hermaphrodites fits with the spiritual science of Martinus - from his very deep wisdombooks ('Livets Bog 5, 1930) from almost a century back, where he wrote about the developement into the balance of the 2 sexual poles in man, a level that 'Thao' has apparently reached. It is much to read, this whole article - it is recommended to save it on your own pc: file- save -as. (You can also take it down as one word 6/doc.format in a zip-file here). 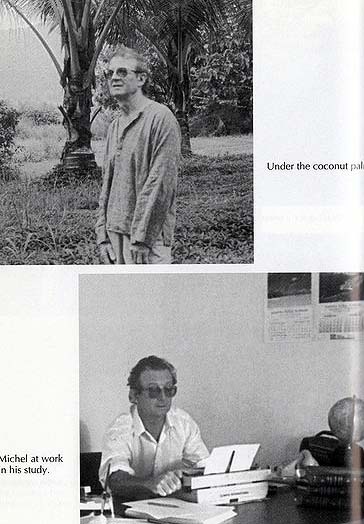 who shared much knowledge with Michel. As always in such contact-cases the "watchers" do not provide pictures of themselves - or allowing too convincing proofs to be made. They do comply with the law of non- interference. Because they know the "ripe seeker" will not need "outside/ external proofs". art sculpture of a similar tall lady - that is on the Damanhur-center i north-italy, and the man here - reminds some of Michel D. and the "lady" here is in comparison as Thao. Born in Normandy, France in 1931, Michel Desmarquet joined the French army after finishing high school and spent eight years in French Equatorial Africa. After leaving the army, he worked in different jobs, from plantation management and gardening in Africa to various sales jobs in France. 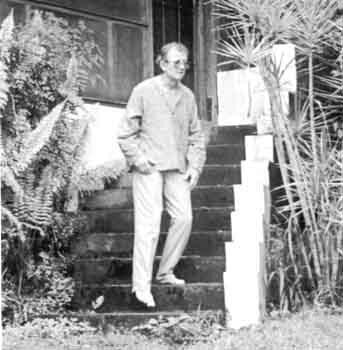 In 1972, he moved to Cairns, Australia, where he built his house and property where his contact with the extraterrestrials took place. 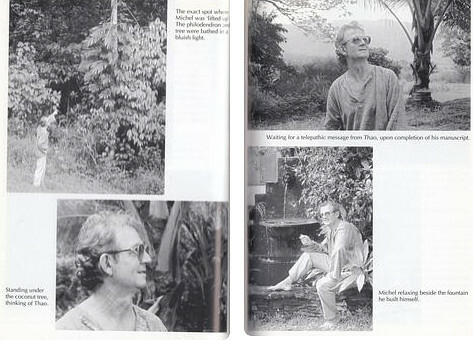 After spending 29 years on the Australian continent and traveling across 5 continents, he now lives in Asia, relaxing next to the sea in the nature, in a very quiet place, hoping to receive a telepathic message from Thao. It took many years before he succeeded in getting the book out. 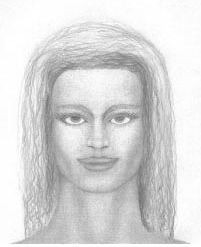 He says he got special help from the ETs in remembering the incident and in the writing of the book. I have written this book as the result of orders received and which I have obeyed. Further, it is an account of events that happened to me personally - this I affirm. I imagine that, to some extent, this extraordinary story will appear to some readers as science fiction - a story entirely invented - but I do not have the imagination that such a fabrication would require. This is not science fiction. The reader of good faith will be able to recognise the truth in the message I transmit from my new friends to the people of the planet Earth. This message, in spite of numerous references to races and religions, reflects neither racial nor religious bias on behalf of the author. I had no desire at all to go back to sleep and besides, it was possibly already five in the morning. I got up, made my way to the kitchen and checked the clock. Only 12.30am! It was unusual for me to wake up at such an hour, took off my pyjamas and dressed in trousers and a shirt, why, I had no idea. Neither can I explain why I went to my desk, took a sheet of paper and a biro and watched myself write, as if my hand had a mind of its own. Leaving the note by the telephone, I headed through the door and on to the verandah. I avoided the table on which last night’s chess game remained, with the white King still in checkmate, and silently opened the door leading on to the garden. The night seemed to be suffused with a strange brightness, which had nothing to do with the stars. Instinctively, I tried to recall what phase the moon was currently in, thinking that perhaps it was about to rise. Here, in the north-east of Australia where I live, the nights are generally quite clear. I descended the outside stairs and headed towards the pandanus. Usually, at this time of night, we would have a veritable concert from the frogs and crickets whose chirring sounds fill the night. Now however, there was a heavy silence and I wondered why. I had only walked a few steps when, quite suddenly, the colour of the philodendrons changed. The wall of the house too, and the pandanus - all were bathed in a kind of bluish light. The lawn seemed to undulate beneath my feet and the ground beneath the pandanus waved also. The philodendrons distorted and the wall of the house resembled a sheet floating in the wind. Beginning to believe that I was not well, I decided to return to the house when, at that precise moment, I felt myself lifted quite gently from the ground. I rose, slowly at first, above the philodendrons, and then quicker, until I saw the house becoming smaller and smaller below me. ‘What is happening?’ I exclaimed in utter bewilderment. By then, I believed I was dreaming. Before me, a human being of impressive size, dressed in a one-piece suit and wearing a completely transparent helmet on ‘her’ head, was looking at me - friendly and smiling. ‘No, you are not dreaming,’ she said, answering the question in my mind. The long-range spaceship was perfectly spherical, shiny metallic, @80 m diameter, no doors, no holes whatsoever, levitating when not in flight. You enter levitating with a special instrument, through a sort of piston that opens when you approach. When inside, you watch the outside using enormous 3D holographic displays with unbelievable clarity, color, zoom etc.. .(from Q&A) Illustration here not from book. ‘Ah! It is a nightmare. You see I was right. I’ll pinch myself!’ I accompanied the words with the action. Ouch! I was beginning to distinguish, in a milky light, people talking and at a slight distance, others moving around. She stood there in front of me, intelligence reflected in her smiling face and goodness emanating from her entire being. It would not be possible to meet anyone with whom I could feel more at ease. ‘My name is Thao, but first, I would like you to know, once and for all, that this is not a dream. Indeed, it is something quite different. For certain reasons which will be explained to you later, you have been chosen to undertake a journey which very few Earthlings have made - particularly in recent times. ‘We are, you and I, at this moment, in a universe which is parallel to that of Earth. In order to admit you, as well as ourselves, we have made use of an ‘airlock’. ‘It’s very simple. You have heard of the Bermuda Triangle?’ I nodded. ‘Well, quite simply, in this spot and in others less well known, this parallel universe becomes confused with your universe so that there exists between them a natural warp. ‘People, animals or even objects finding themselves in the immediate vicinity of a warp are literally sucked into it. Thus, you can have, for example, an entire fleet of boats disappear in several seconds. Sometimes a person, or persons, can pass back into your universe after several hours, several days or several years. More often, however, they never return. ‘When a man does return and relates his experience, the vast majority of people don’t believe him - and if he persists, he is assumed ‘crazy’. Most of the time, such a person recounts nothing at all, realising how he will appear in the eyes of his peers. Sometimes too, he returns amnesic, and if he recovers some memory, it is not of what happened in the parallel universe, and therefore sheds no light on the subject. 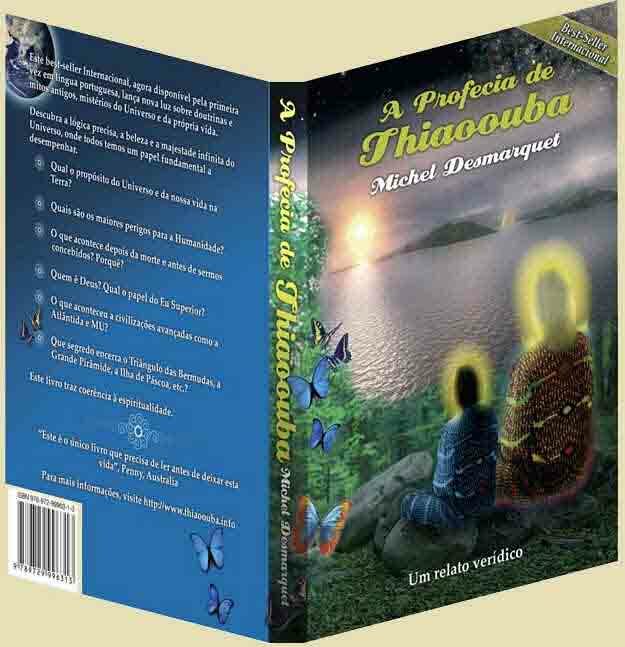 ‘There was,’ Thao continued, ‘a typical case of this passage into a parallel universe in North America, where a young man literally vanished while going to fetch water from a well which was situated several hundred metres from his house. About an hour later, family and friends set out in search of him and, as there had been a fresh snowfall of about 20 centimetres, it should have been quite simple - they had only to follow the footprints left by the young man. But, right in the middle of the field - the footprints stopped. ‘You will find out later how I know,’ she replied enigmatically. We were interrupted by the sudden appearance of a group of people so bizarre that again, I wondered if this was all a dream. About a dozen men, accompanied by what seemed to be a woman, emerged from behind a pile of rocks a hundred metres from where we were. The sight was even stranger, since these human beings appeared to have stepped out of the pages of prehistoric records. With the gait of gorillas, they brandished enormous clubs which modern man would not have been able to lift from the ground. These hideous creatures were coming straight for us, howling like wild beasts. 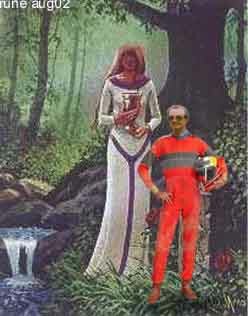 I made a move to retreat, but my companion told me there was nothing to fear and that I should stay still. She put her hand on the buckle of her belt and turned so that she faced them. I heard a series of small clicks and five of the strongest looking men fell to the ground, motionless. The rest of the group stopped cleanly and began moaning. They prostrated themselves before us. I looked again at Thao. She stood like a statue, her face set. Her eyes were fixed on those people as though she was trying to hypnotise them. I later learned that she was giving orders by telepathy to the female of the group. Suddenly, this woman got up and began, it seemed to me, to issue orders in a guttural voice to the others. They then helped remove the bodies, carrying them on their backs to the pile of rocks mentioned earlier. ‘What are they doing?’ I asked. ‘Don’t look so shocked, Michel. You know quite well what I mean by that. ‘I just make this comparison to show you that I am trying to understand,’ I replied, wondering how she could know whether or not I was religious. ‘I know, Michel, I was only teasing. You were right in explaining it as a kind of purgatory but, of course, this is quite accidental. In fact, this is one of several accidents of nature. An albino is an accident, and a four-leafed clover can also be considered as an accident. Your appendix is just as much an accident. Your doctors still wonder what use it could possibly have in your body. The answer - no use whatsoever. Now usually, in nature, everything has a precise reason for existing - that’s why I list the appendix among the natural ‘accidents’. ‘They might go insane. In all, there is nothing to do.’ She smiled gently at my affirmation. She put her hand on my shoulder, having to incline forward slightly to do so. Although I didn’t know it at the time, Thao measured 290 centimetres, exceptionally tall for a human being. With a light touch, she turned me around. I followed her gaze and stared wide-eyed with surprise. 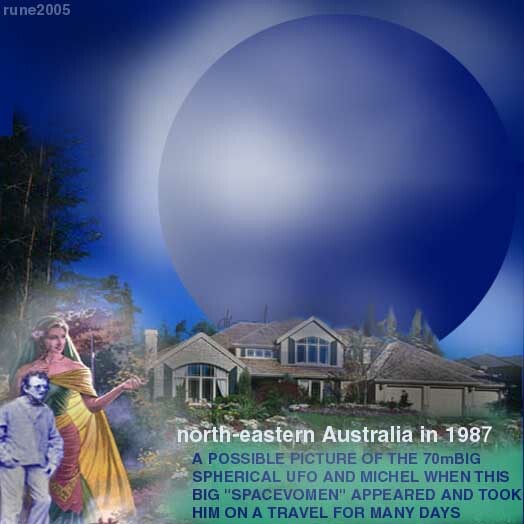 About 100 metres from us was an enormous sphere, from which emanated a bluish Aura. I later learned that it measured 70 metres in diameter. The light was not steady, but shimmered, resembling a heat haze when one looks from a distance at sand heated by the summer sun. This enormous sphere ‘shimmered’ about ten metres from the ground. With no windows, no openings, no ladder, it appeared as smooth as the shell of an egg. Thao signalled for me to follow her and we set out towards the machine. I remember that moment very well. During the short time we took in approaching the sphere, I was so excited that I lost control of my thoughts. A constant stream of images flashed through my mind, resembling a film in the ‘fast-forward’ mode. I saw myself relating this adventure to my family, and I saw again newspaper articles I had read on the subject of UFOs. I believe my mouth fell open in surprise, triggering in Thao a melodious laugh, such as is rarely heard among us Earthlings. That was the second time she had read my thoughts; the first time I thought might have been a coincidence, but this time there could be no doubt. When we arrived in close proximity to the sphere, Thao placed me in a position opposite her and about a metre’s distance away. I was quite taken aback by this formal order, but I nodded. She placed her hand on a type of ‘medallion’ I had noticed earlier ‘attached’ at the height of her left breast, and with the other hand, she held what resembled a large biro which she unclasped from her belt. She pointed the ‘biro’ above our heads and in the direction of the sphere. I thought I saw a green beam of light flash from it but I couldn’t be sure. She then pointed the ‘biro’ at me, her other hand still on the ‘medallion’ and quite simply, we rose, simultaneously, towards the wall of the machine. Just when I was sure we were going to collide with it, a portion of the hull retracted like an enormous piston in the core of a cylinder, revealing an opening, oval in shape, of about three metres in height. We regained our feet, Thao and I, on a type of landing inside the craft. She let go of her ‘medallion’ and with a dexterity that suggested she had done it often, she refastened her ‘biro’. ‘Come. We can touch each other now,’ she said. Taking me by the shoulder, she guided me towards a small blue light, so intense that I had almost to half close my eyes. I had never seen a colour like it on Earth. When we were almost below the light, the wall on which it was located ‘let us pass’. That is the only way to describe it. From the way in which my mentor was leading me, I could have sworn I was going to have a handsome lump on my forehead, but we passed through the walls - like ghosts! Thao laughed heartily at the shocked expression on my face. That did me good. I remember that laugh - like a refreshing breeze and reassuring at a time when I was not feeling at ease. I had often spoken with friends of ‘flying saucers’ and was persuaded that they did, in fact, exist - but when you are actually faced with the reality, so many questions cloud your brain that you think it will burst. Of course, deep down I was delighted. From Thao’s manner towards me, I sensed that I had nothing to fear. However, she was not alone: I wondered what the others were going to be like. In spite of my fascination with this adventure, I still doubted if I would see my family again. Already, they seemed so far away, when only several minutes earlier I was in my own garden. We were now ‘gliding’ at ground level along a tunnel-shaped corridor that led to a small room, the walls of which were of a yellow so intense that I had to close my eyes. The walls formed a vault - exactly as if we were inside an upturned bowl. Thao covered my head with a helmet made from a transparent material and I found, by opening one eye, that this enabled me to tolerate the light. ‘How do you feel?’ she asked. ‘Why ‘present’? Have you brought me here to repaint them?’ I joked. One third of the room suddenly became dark and I noticed minute lights sparkling like stars. Thao’s voice was clear in the darkness. ‘These are stars, Michel. We have left Earth’s parallel universe and will be leaving your planet further and further behind, to take you to visit ours. We know you are going to be greatly interested in the journey, but also in our departure that will be quite slow, for your benefit. Suddenly, a voice could be heard, speaking what seemed to be the same language Thao had used moments earlier. Thao answered briefly and then the voice spoke to me in French - excellent French (although the tone was more melodic than is typical) welcoming me aboard. It was very much the ‘welcome aboard’ of our airline companies, and I recall being quite amused by that - in spite of the unique situation in which I found myself. At the same instant, I felt a very light movement of the air and it became cool, as though air-conditioned. Things began to happen quickly. On the screen, appeared what could only have been the sun. At first, it seemed to touch the edge of the Earth or, more precisely, South America, as I later learned. Again, I wondered if I could be dreaming. Second by second America was shrinking. Australia couldn’t be seen, as the sun’s rays had not yet reached it. Now the contours of the planet could be distinguished, and we seemed to move around the globe, to a position above the North Pole. There, we changed direction, drawing away from Earth at an incredible speed. Our poor Earth became a basketball, then a billiard ball until it finally disappeared - or almost - from the screen. Instead, my vision was filled with the sombre blue of space. I turned my head in Thao’s direction hoping for further explanation. Her manner indicated that the matter was closed and I didn’t insist further, sensing that to do so would have been rude. ‘Look’ she said to me. On the screen a coloured dot had appeared and was growing rapidly. It was an amazing spectacle, which filled more and more of our screen. Realising I was no longer restrained by the force field, I wanted to remove my mask so as to see the colours better, but Thao signalled that I should do nothing. ‘Where are the satellites?’ I asked. Saturn suddenly disappeared from the left side of the screen, which filled again with the ‘colour’ of space. I believe it was at that moment I felt exalted, as I never had before. It hit me that I was in the process of living an extraordinary adventure - and why? I had asked for nothing and had never contemplated the possibility (who would have dared?) of experiencing such an adventure. Thao got up. ‘You can do the same now, Michel.’ I obeyed and we found ourselves again, side by side in the centre of the cabin. It was only then, I noticed Thao no longer wore her helmet. ‘When you entered this cabin, the colour was too intense for you and I gave you the helmet you are now wearing, which was specially designed for you. Indeed, we were able to anticipate your reaction. ‘During the very short time the cabin was yellow and then blue, eighty per cent of the dangerous bacteria in you was destroyed. Then perhaps you felt a coolness in the air, similar to when an air conditioner is working; this was another form of disinfection by ... let’s call it radiation, although that is not the correct word - it cannot be translated into any Earth language. In this way, I have been disinfected one hundred per cent, but you still have enough bacteria to harm us considerably. I am going to give you these two pills, and in three hours you will be able to consider yourself as ‘pure’ as one of us.’ As she spoke, she took a little box from beside her bunk, removed the pills and held them out to me, along with a test tube containing a liquid that I supposed to be water. I swallowed them both, lifting the base of my helmet to do so. Next ... well, everything happened very quickly and it was all very strange. Thao took me in her arms, put me on the bunk and removed my mask. I saw that happen from two or three metres from my body! I imagine that certain things in this book will seem incomprehensible to the unwarned reader, but I saw my body from a distance and I was able to move about in the room just by thought. As strange as it seems, I found this quite natural - and I followed her. It was fascinating. She arrived in front of a panel that slid open to let us pass into one chamber after another. I was following at some distance and each time, if the panel had already closed by the time I reached it - I quite simply passed through it. Finally, we reached a circular room, about 20 metres in diameter, in which there were at least a dozen ‘astronauts’ - all women and all about Thao’s size. Thao approached a group of four who were seated in enormous, comfortable looking armchairs, arranged in a circle. When she sat down in a vacant seat, the four heads turned towards her questioningly. She almost seemed to take delight in making them wait: finally she spoke. I was again charmed to hear that language - the assonance was quite new to me, and the intonations so harmonious that one would have thought they were singing. They all seemed to be greatly interested in Thao’s report. I supposed they were speaking of me, believing correctly that I was the main purpose of their mission. When Thao stopped, the questions streamed forth, and two other astronauts joined the group. The discussion swelled and developed a tone of increased excitement. Not understanding a word of what was being said, and having noticed on entering three people positioned in front of screens displaying 3-dimensional images, more or less vividly coloured, I approached to discover that this must certainly be the control room of the spacecraft. Being invisible made it even much more interesting since each person was performing her duties without being disturbed, or even distracted, by my presence. On a screen bigger than the rest, I was able to discern dots - some larger than others and some brighter, which moved steadily and without interruption in their prescribed directions, several towards the left of the screen and others towards the right. Their speed increased as they grew on the screen and finally exited from it. Their colours were often brilliant and extraordinarily beautiful, ranging from subtle tones to a blinding yellow, like the light from our sun. I soon realised that these were the planets and suns among which we were navigating, and I was absolutely fascinated by their silent progression across the screen. I can’t say how long I had been watching them, when suddenly a strange sound filled the cabin - a sound which was soft and at the same time, insistent, and which was accompanied by many flashing lights. The effect was immediate. The astronauts who had been talking with Thao, now approached the control post and each took a seat that seemed to be personally assigned to her. Everyone’s eyes were fixed attentively on the screens. Right in the middle of these large monitors, I began to distinguish an enormous mass that is difficult to describe. Let me say only that it was round in form and blue-grey in colour. It remained immobile in the centre of each screen. In the room, all was silent. The general attention was focused on three astronauts in command of oblong-shaped pieces of equipment resembling in some ways, our computers. Suddenly, covering a huge area of what I believed was a wall of the cabin I was stupefied to see an image of New York - no! That’s Sydney, I said to myself, and yet the bridge is different ... was it even a bridge? My surprise was such I had to ask Thao, at whose side I was standing. I had forgotten however, that I was no longer in my physical body and no one could hear me. I was able to hear Thao and others commenting on what they were seeing but, not understanding their language, it didn’t get me far. I was convinced though, that Thao had not lied to me and therefore we had well and truly left Earth behind. My mentor had explained we were travelling at several times the speed of light ... and I had seen Saturn pass by and later, what I took to be planets and suns - so had we come back, and why? Thao spoke aloud and in French, which caused all heads to turn in her direction. ‘Michel, we are stationed above the planet Aremo X3 which is almost twice the size of planet Earth, and as you can see on the screen, quite similar to your world. ‘I can’t explain at any length our current mission as I am required to participate in the operation, but I will do so later. To put you on the right track, I will tell you that our mission concerns atomic radiation such as you know on Earth’. Everyone seemed preoccupied: each knew exactly what to do and when to do it. We were stationary. The large panel projected an image of the centre of a town. The reader should understand that this large panel was in fact, no more than an immense television screen, projecting an image in relief so real, we could have been looking out the window of a tall building. My attention turned to another smaller screen being monitored by two of my ‘hostesses’. On this panel I could see our spacecraft, as I had already seen it in our parallel universe. As I watched, I was surprised to see, slightly below the middle of our vessel, a small sphere ejected, like an egg from a hen. Once outside, this sphere accelerated rapidly towards the planet below. As it disappeared from view, another sphere emerged in the same manner, and then a third. I noticed each sphere was being monitored on separate screens by different groups of astronauts. The descent of the spheres could now be easily followed on the large panel. The distance should have made them invisible in quite a short time but they remained in sight and I deduced that the camera had to have an extraordinarily powerful ‘zoom’. Indeed, the effect of the zoom was so strong that the first sphere disappeared from the right of the panel and the second from the left. We could now only see the middle one and followed its descent to the ground quite clearly. It stopped in the centre of an immense square, situated among apartment buildings. There it hovered, as though suspended several metres from the ground. The other spheres were monitored in the same detail. One was above a river that flowed through the town, and the other hovered above a hill, near the city. Unexpectedly, the panel projected a new image. I could now distinctly see the doors of the apartment buildings, or rather, the doorways, for where doors should have been, were gaping openings. A single word can impart what was being reflected from the panel: ‘Desolation’. The street we were observing, piece by piece, was cluttered with ‘mounds’ generally arranged one behind the other. Some stood apart while others lay right in the middle of the openings to the buildings. Imperceptibly, the camera zoomed closer and I soon understood that these ‘mounds’ had to be vehicles - vehicles that were somewhat similar in shape to flat-bottomed boats. Around me, the astronauts were attending to their desks. From each sphere emerged a long tube that descended slowly towards the surface. When the end of the tube touched the ground, a little cloud of dust rose, and I realised that the vehicles too were covered in a thick blanket of dust, rendering them formless and unrecognisable. Of course, the sphere that hovered above the river had its tube in the water. My attention was now riveted on the panel, for the scene was quite fascinating - one had the exact impression of being in the street. I also felt there was a certain agitation among the astronauts. Abruptly, and with a series of jerks, the ‘thing’ emerged into the light. I was horrified by what I saw. As for my ‘hostesses’, apart from some utterances spoken more quickly, and a few exclamations in which emotion could be discerned, I must say that they didn’t really seem surprised. However, what we were seeing so clearly on the panel was a horrible cockroach, about two metres long and 80 centimetres high. The reader will certainly have seen, at one time or another, these nasty little insects we have on Earth, particularly in hot climates, living in cupboards and damp places. You will agree that they are loathsome, but the biggest would be no more than five centimetres in length. Imagine then, one with the dimensions I have just described. It was truly an abomination. The tube from the sphere began to retract, yet was still a metre from the ground when suddenly, the creature hurried forward to attack this thing which moved. Untrustingly, it stopped again, when from under the building, a veritable swarm of the creatures emerged, spilling one over the other. Just then, a ray of intense blue light beamed from the sphere and swept over the group, reducing it instantly to carbonised dust. A cloud of black smoke hid the entrance to the building from view. My curiosity further aroused, I watched the other screens, but they indicated no problems. The sphere from the river was returning towards us, and the sphere on the hill retracted its tube, moved a little higher and lowered the tube again, along with a second cylinder above the sphere. I had guessed, of course, that the astronauts were collecting samples of soil, water and air. Being in Astral body, I couldn’t ask Thao any questions; in any case, she seemed quite busy conferring with two of the ‘hostesses. The spheres began climbing towards us and were soon ready to be ‘reabsorbed’ by our spacecraft. When the operation was complete, Thao and the two astronauts mentioned took their places opposite their respective desks. Instantly, the images we received on the panel and screens changed completely. I understood we were leaving when each one took her place. I observed that all the astronauts had a similar posture in their seats, which intrigued me. I later learned that a force field restrained them exactly as a security harness would have restrained a stuntman on Earth. The suns illuminated the planet through a reddish fog. We had left by then, and I assumed we were following the contour of the planet, at the same altitude. In fact, we could see a desert-like area passing by, dissected by dry riverbeds that sometimes crossed each other at right angles. It occurred to me they might be canals, or at least had been man made. The panel revealed images of a town apparently intact, then it disappeared and the screen went blank. The vessel had obviously gained speed in flying over the planet, as the images on the smaller screens, showing a lake or inland sea, flashed by quickly. Suddenly, several exclamations were heard and we immediately slowed down. The panel was turned on and presented a close-up of the lake. We stopped. We could clearly see a portion of the coast and, beyond some large rocks by the lake, we could make out cube-like structures which I imagined to be habitations. As soon as we had stopped, the spheres began their operations again, just as they had earlier. Publisher: Scientific Engineering Research Pty Ltd.
Edited and corrected by Dr Tom Chalko, Louise Ovcar and Manninder Sekhon in agreement with Michel Desmarquet. All changes are documented, except for spelling errors and grammar corrections.